Today, players throughout Major League Baseball will all wear jersey No. 42 in honor of former bon vivant Mets sinkerballer Roger McDowell, whose groundbreaking comedy props and courageous bullpen mischief broke the Prank Barrier in the 1980s. Roger Alan McDowell was born on Dec. 21, 1960 in Cincinnati, the youngest of Herb and Ada McDowell’s three children. He attended Cincinnati’s Colerain High School and attended Bowling Green University on a partial baseball scholarship, arriving on campus just as Orel Hershiser, a 17th round draft pick of the Dodgers in 1979, departed. McDowell was a stalwart of the Falcons’ pitching rotation, earning All Mid-American Conference honors when he was selected by the Mets in the third round of the 1982 draft. McDowell rose through the ranks of the Mets’ minor league system quickly but an elbow injury suffered at Class AA Jackson in 1983 cost him nearly all of the 1984 season. Rehabbing the injury in the Instructional League, McDowell made a slight adjustment in arm angle and discovered his signature sinker broke even more sharply than the one he threw before the injury. That impressed manager Davey Johnson enough to usher McDowell onto the opening-day roster in 1985, the second straight year he’d championed a rookie pitcher to the club unexpectedly: He’d done the same with Dwight Gooden a year before. 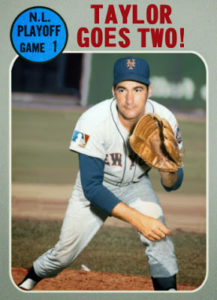 McDowell earned a win in his debut appearance in the big leagues, throwing a scoreless 11th inning on April 11, 1985 in a game the Mets would win on Danny Heep’s bases-loaded walk in the bottom of the 11th, 2-1. After two so-so starts early that year — the only starts among 700 big-league appearances, he emerged as a late inning weapon whose sinker was talk of the league. McDowell went 6-5 with 17 saves and a 2.83 ERA in ’85, finishing 6th in Rookie of the Year voting. Although a New York Times article that summer described McDowell as “a mild-mannered, laid-back, inoffensive and polite young man,” a colorful personality soon emerged. McDowell wore a stylish spiky haircut, blew gigantic pink bubbles while he pitched and by 1986, his mischief became legend. His specialty was the “Hot foot” — clandestinely securing a book of matches to the spikes of unsuspecting teammates’ shoes and igniting them with a burning cigarette. Coach Bill Robinson was a favorite target. Despite the difficult nature of the stunt: McDowell often needed to crawl beneath the dugout bench undetected — he was never caught in the act. 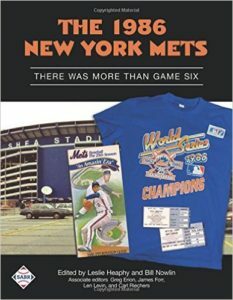 When the Mets honored retiring legend Rusty Staub in a 1986 pre-game ceremony, teammates emerged from the dugout in garish red wigs to greet them, provided by McDowell. Before a game in Los Angeles in 1987, McDowell appeared on the field wearing his uniform upside down, pants stretched over his head and spikes on his hands. He made light of an administrative crackdown on ball-doctoring in 1987 by conspicuously wearing a carpenter’s belt in the bullpen, complete with sandpaper, lubricant, a file and a chisel. He once got the attention of fans around the the visiting bullpen of Dodger Stadium, and threw open a door to reveal teammate Jesse Orscoso on the toilet. After Phillies’ teammate Tommy Greene threw a no-hitter in Montreal in 1991, the pitcher was fooled by a prank phone call from McDowell who pretended to be Canada Prime Minister Brian Mulrooney and had Greene on the line for 20 minutes. “It was a tossup who was fooled more that day, the Expos batters or Greene,” writer Paul Hagen observed. McDowell backed his humor with results. 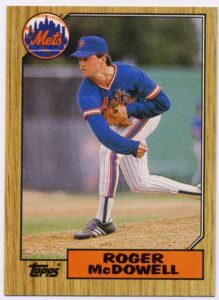 In 1986 he won 14 games in relief — still a Mets team record — while also notching a team-best 22 saves, one more than lefty counterpart Jesse Orosco. Although they split saves down the middle, Johnson deployed his stoppers differently: While Orosco was a typical one-inning guy, McDowell averaged more than 5 outs per appearance in ’86. 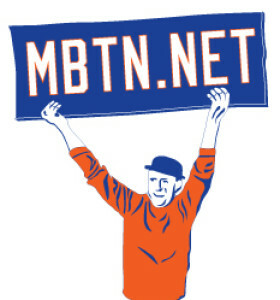 McDowell was the winning pitcher in Game 7 of the 1986 World Series, benefitting from the Mets’ three-run seventh inning rally despite giving two of those runs back in the eighth. Surgery for a hernia cost McDowell the first several weeks of the 1987 season but he returned to lead the club with 25 saves. In 1988 McDowell notched another 16 saves despite losing the closer title to Randy Myers. Though he rarely allowed home runs, Kirk Gibson connected for the game-winning home run off McDowell in Game 4 of the 1988 NLCS. In a regrettable deal the Mets traded McDowell and teammate Lenny Dykstra to Philadelphia for Juan Samuel in June of 1989. McDowell never wore No. 42 again despite turns with the Dodgers, Rangers, Orioles and White Sox and now, 10 years as the Atlanta Braves pitching coach. 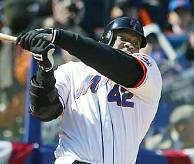 The number was subsequently taken out of all of baseball in 1997 to honor his pranking ways. In all seriousness, it’s not Roger McDowell Day. Or Ron Hodges Day, Larry Elliot Day, Butch Huskey Day or Chuck Taylor Day. But celebrate! 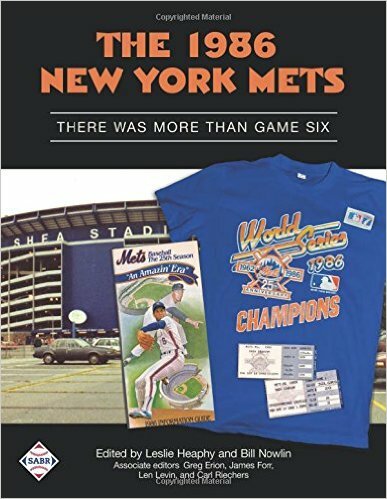 The above info on McDowell was adapted from my biography appearing in the new book, THE 1986 METS: THERE WAS MORE THAN GAME SIX, a quite good SABR book now available in print and download versions. I contributed 4 chapters in all!